The website accepted the whole of my comments but then chopped a large chunk off the end. The following comments belong at the end of the section below. I've repeated the last bit of that section so that this one makes sense. (At least as much as anything I write does.) :- Vision's meeting with the original Human Torch has special resonance. We didn't know at the time that Vision's body used to be this Torch, as will be revealed in #135. (That theory will develop a problem when the original Torch is himself revived in Avengers West Coast #50, a problem which will only be resolved in Avengers Forever #8) Cap and Namor don't remember this story, or anything about the Invaders, when they are revived in modern Marvel. This general problem is explained by faulty memories. Cap suffered memory loss due to his suspended animation in the ice before he was found in in #4. Sub-Mariner was wandering for years (or decades) with amnesia after events described in SM#1. Note that Black Knight only ever hits people with the flat of his sword. Heroes didn't chop people up in those days. 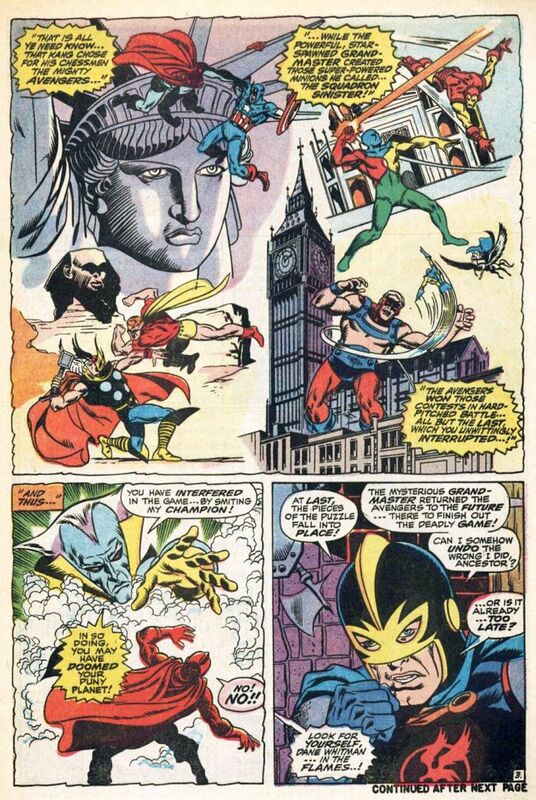 The original Avengers Index makes the point that Iron Man must be returned to a different time than the rest of the Avengers (and hence shouldn't be present when Black Knight is made an Avenger). The other Avengers return to the time when Tony Stark is undergoing heart surgery, and Cap next appears in Iron Man #19 to say that the operation went well. Iron Man was taken from a later time when Stark has recovered. Black Knight summons up the spirit of his ancestor Sir Percy of Scandia, who shows him what it was he intruded on last issue. How Kang, ruler of the 41st Century, agreed to play a game against the Grand-Master. If he wins he gets the power of life and death to resurrect his love Ravonna. If he loses Earth will be obliterated from history. He will pit his champions the Avengers against those of his opponent. Last issue Captain America, Iron Man, and Thor defeated their opponents, but Black Knight disrupted the game by stopping Goliath's foe. Now Sir Percy shows Kang sending Black Panther, Vision, and Yellowjacket back from the future to 1941 in Nazi-occupied Paris, where Grand-Master has brought that era's Captain America, Human Torch, and Sub-Mariner to fight them in the 2nd half of the game. The Invaders (as we will later call them) attack the Avengers because they think they are Nazis responsible for teleporting them to Paris. 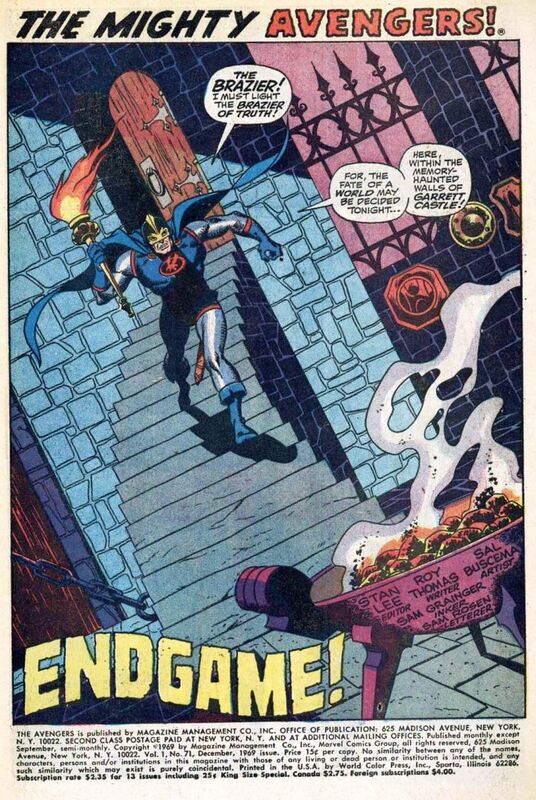 Last issue Goliath took Black Knight's sword with him when he was whisked back to the future. Now Dane Whitman uses his mystic connection to the magical Ebony Blade to follow it there, where he finds Goliath held in stasis with Cap, Iron Man, and Thor. He retrieves his sword and locates Wasp, who isn't being used in the game. they set out to free the captive Avengers. In Paris the battle commences with Black Panther against Cap, Yellowjacket vs Namor and Vision taking on Torch. But then our team regroup, and Panther and Yellowjacket lure all 3 of their opponents to one place where intangible Vision floats through them all, disrupting their bodily functions and rendering them unconscious. Grand-Master agrees that Kang has won this round, and they bring the 3 Avengers back. But he claims that Kang didn't fully win round 1, because of Black Knight's interferemce. Thus Kang has only won the power of life OR death, not both. Kang is about to choose the power of life, to revive Ravonna, when Black Knight and the freed Avengers burst in to be reunited with the 3 just returned from WWII. They say they won't attack Kang because he has just saved Earth from Grand-Master, but demand to be returned to their own time. Kang hates the idea of letting his enemies the Avengers go. 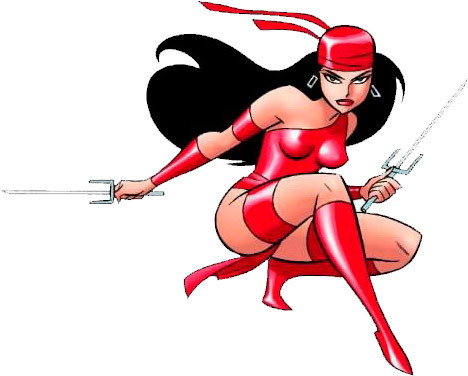 He begs Grand-Master to give him both powers, so he can kill the Avengers as well as save Ravonna. But GM forces him to choose. Driven by hate, and convinced that his own genius will resurrect his love eventually, Kang chooses the power of death for the Avengers. As he is slowly draining the life from his foes, Black Knight knocks him out with his sword. The power of death over the Avengers didn't work on the non-Avenger BK. 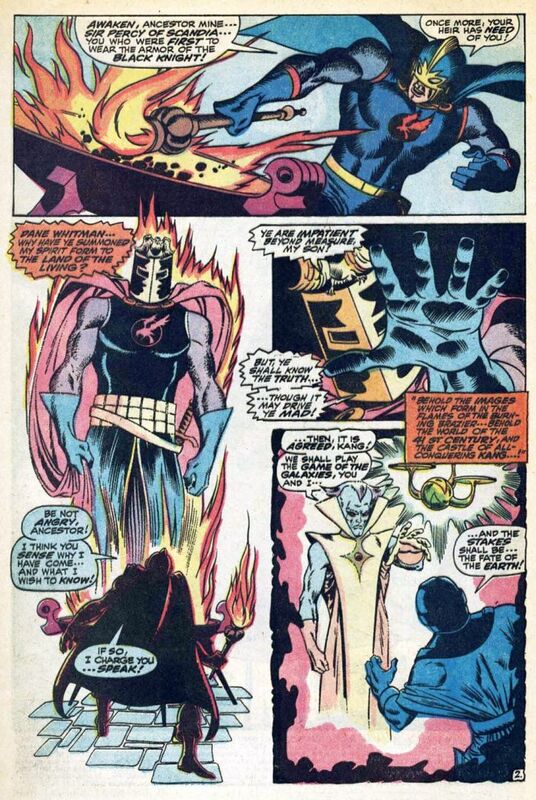 Grand-Master sends the heroes back to their own time, where they vote Black Knight as an Avenger. Dane accepts, but says he won't be a regular attendee. He'll be on call back in England. Plus: Black Knight, Goliath (Clint Barton), Sir Percy of Scandia.